SeaHeart, born and raised in Pittsburgh, PA and having lived during her adolescent years with her family on the coast of Texas and In Little Rock, Arkansas, has enjoyed a rich and varied career which weaves media, the healing arts , human potential, and organic agriculture into joyful accessibility… accompanied by her passion for Mother Ocean, Mother Gaia, anthropology, archaeology, design, natural building, and intentional community. BA Fine Art 1968, Connecticut College, New London, CT.
teaching centers: VT, NYC, Boston, Miami. 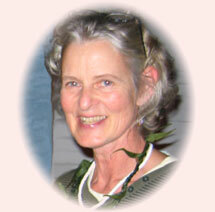 LMP (Licensed Massage Practitioner) Port Townsend School of Massage 1997, WA [LMT Credentials OR 2009]. Underwater and aerial cinematography – collaborations with author Peter Tompkins, Bahamas. Producer/On-air Host – State of the Weather/Shape of the World – WPSX-TV, State College, PA.
Co-Producer/ Director – Media Pittsburgh – CATV, Pittsburgh, PA.
News film camera – WIIC-TV, Pittsburgh, PA.
Producer/Writer/ On-air personality/Public Relations – WQED-TV, Pittsburgh, PA.
* Documentary of conceptual artist Le Ann Bartok Wilchusky's "Skyworks, The Red Mile," PA.
* Spot advertising and documentary shorts for magazine format programming – various. QED-Renaissance / Pittsburgh Magazine published by WQED. Newsletters : “Stewards of the Earth Arise!” – Grow Food not Lawns, Larimer County, CO.
“Seed Midden” - Abundant Life Seed Foundation, Port Townsend, WA. Booklets: “Making a Television Program” – Mr. Rogers’ Neighborhood, Pittsburgh, PA.
“Preventing Drug Use in the Community” - The TurnedOn Crisis program series, WQED Pittsburgh. Garden Manager/Instructor – SeaShore Community Garden / Seashore Family Literacy, Waldport, OR. Co-creator and instructor – Grow Food not Lawns, Larimer County, CO.
Farm and CSA Manager – Port Townsend EcoVillage, WA. Abundant Life Seed Foundation – seed gatherer, public relations, advertising, Port Townsend, WA. Manager, bulk herb section – Port Townsend Food Coop, WA. Cottage industries: *cultivated and wildcrafted herbs, * shiitake mushrooms, *open-pollinated seeds *cultivars *goat products *chickens. Farm Manager and colleague Peter Tompkins through his authoring of SECRETS OF THE SOIL-- conducted controlled demonstrations of various expressions of organic agriculture including Biodynamics and Sonic Bloom, Shepherdstown, WV. Exhibitions: watercolors, photography -- Central Coast, OR; Port Townsend, WA. “Orbs: What is Going On” – Prophets Conference, Sedona, AZ. “Orbs over Port Townsend,” Port Townsend, WA. Metal sculpture, Lyman Museum, New London, CT. Provisional Fellow – Center for Advanced Visual Studies, M.I.T., Cambridge, MA. “Environmental Spectacle”: Project LIFT-OFF – Pgh, PA.
Raising Atlantis – Cambridge, MA; Bimini, Bahamas. EAT [Experiments in Art and Technology] projects pairing artists with industrial materials and access to r&d: Polyurethane foam dome exhibit space for WQED, Allegheny County Fair, PA.
Technical Illustrator, CQA, Polaroid Corp, Cambridge, MA. *Period architectural features; historic musical instrument reproduction; custom cabinetry -- Shepherdstown, WV and Port Townsend, WA. *Top level joiner/designer – Admiral Marine Works , Port Townsend, WA. *Custom yacht repair, restoration, design – Fort Lauderdale, FL; Port Townsend, WA. *Woman Works – consultation / support for woman designer/builders – Port Townsend, WA. *Restoration Hinckley Sou’wester 35’ wood sloop, Fort Lauderdale, FL. Cob and light straw in-fill designs. Free lance remodels and historic restorations– Port Townsend, WA; Shepherdstown, WV. Owner, Operator: A Healing Place Within – Therapeutic Massage and Energy Work since 1997. Workshops, various venues: Whale Medicine, Introduction to Tantra, Exploring self-care tools; Mantra and Healing with Sound, Flow Yoga. Special enjoyments: Natural world, everything in and on the water; dance and improvisational voice. tel: (541) 563-8333 | email: SeaHeart@ahealingplacewithin.com | © 2013 by SeaHeart Elan. All rights reserved.